If you ever had even a vague interest in the custom motorcycle scene and wanted to expand your knowledge – and probably your mind too – then the Bike Shed show is the best place to do it! Anyone who's anyone will be passing through the doors over the weekend, and there are going to be some spectacular machines on display from the world's best custom builders. As a warm-up to the show, we recently headed to The Bike Shed in London's Old Street to swing our leg over a few new Harley-Davidsons, not least of which was the brand new Roadster – that we previewed a few weeks ago. I was already a Roadster fan from the images that H-D had put out there, but in the metal it's even better looking. The upside down forks give it a much more racey look, and the twin front discs really announce its intentions. 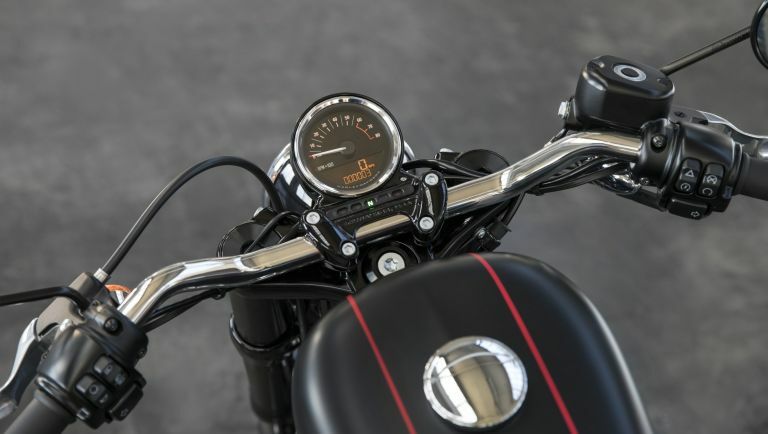 The pin-striping on the petrol tank give a classy retro-racer feel, as does the two-up seat that they've sculpted to feel even more like a classic café racer of the early 1950s and 1960s. As soon as you climb on-board, the tucked in position from the backwards sweep of the bars makes it feel much more immediate than that of the other Sportster models such as the Iron 883. Sadly, we didn't have much room in east London to stretch the Roadsters legs – we needed to take it home to the sublime corners of Wales really – but it felt and sounded awesome. This is a bike built for nailing corners much more so than any other Harley we've ridden so far, and aesthetically it's all there too. Harley do a thing called Dark Custom, which means you can spec your bike in any number of ways to make it just the way you want it, and this Roadster is a perfect place for you to start that journey. It's also ridiculously affordable! You can get one of these in time for the alleged 'hottest British summer ever', that's due to start in a couple of weeks, for about a hundred quid a month. That's an awful lot of fun for around the same price as a skinny latte a day!